Received my order this morning! The prices were very good but the wait was LONG! My order was placed in July…hmmmm. On Facebook, the store gives away many prizes. Can’t wait to use the Spellbinders Tool ‘n One. Good for many of my Memory Box dies. 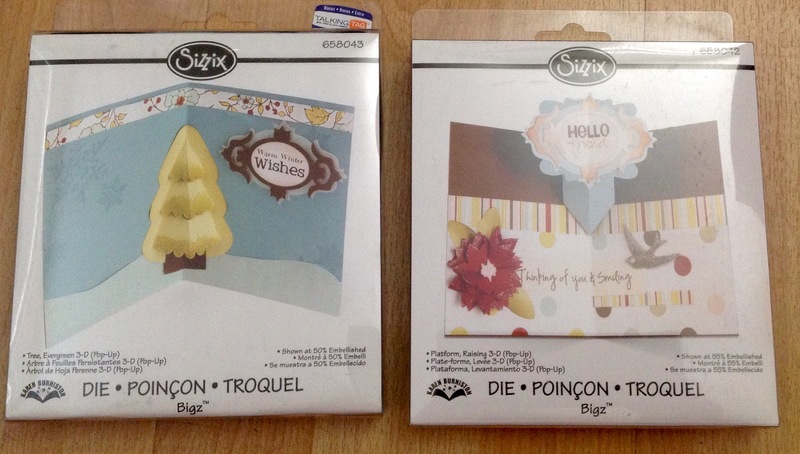 I bought a lot of Sizzix dies. Here are just two 3D pop up dies. Here is the Stand Up Card die. Finally, more Memory Box to add to my collection. I got dies from $1 and up. Lots of under $5 dies. WOW, nice haul indeed!!! DId they have a good sale or discount? I’d love to visit the store…one day. Stacey seems like a really nice and happy person. Looks like a fun place to work at. Nice haul! I live 20 mins from SMS but they were sold out of stuff in the store so I had to buy from their website – I can’t remember what I ordered! I hope it comes soon! Actually was there today “browsing” – bought too much … again! Oh my, looks like your pkg. took the scenic route to your mailbox. Glad you received it though and can’t wait to see what you create with them.